WASHINGTON — Democratic presidential front-runner Hillary Clinton would lose to every one of the top five Republican contenders in a head-to-head match-up — a complete reversal of fortune for the New York senator who has thus far led against all prospective GOP opponents — according to a new Zogby poll released late Monday. So, this, as reported here and elsewhere, probably required a response from here campaign. I told those staffers to hide this poll. I am certain her Billaryness went ballistic when she saw this headline. Penn went on yesterday's "Morning Joe" and petulantly told host Joe Scarborough that a Zogby poll that showed Hillary losing to all the leading Republicans is "a meaningless poll, and really, frankly, shouldn't even be on your show." Seeking to undercut the poll's credibility, Penn flatly claimed "that was Zogby's first interactive, on-line poll ever." Translation of the bolded piece: You are a traitor to us because you are speaking ill of Hillary and you will be destroyed too if you continue to question Hillary's birthright to the American Presidency. SCARBOROUGH: Let me ask you about the Clinton campaign. I understand, also, that after chastising us for mentioning your poll, even suggesting that Americans know this information which we're going to give to them in a minute, after we make sure that we can take it out of quarantine, that actually your biggest -- the campaign that has been your number one customer in requesting polls is who? ZOGBY: Penn & Schoen [Penn's polling firm] they call, every time they call for our telephone surveys and they call for our online surveys and they ask us also for additional cross-tabulated data from both. And so, I was just kind of curious, you know, it's one thing to attack the poll but it's another thing to say, to try to dismiss it as the first time. Well, they've got a whole backlog of Zogby online polls that they've been studying now for at least five years. SCARBOROUGH: Online polls. So they actually look at these online polls, and they've been studying them for five years despite the fact they say this is the very first online poll you've ever conducted. That's very interesting. ZOGBY: It is very interesting. You sort of have to be a little careful. You know, there's a whole campaign handbook of things that you say to dismiss polls. But you should mire them in a little bit of truth. SCARBOROUGH: You have to be careful! Hmmmm..... 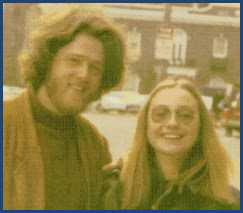 Seems to me that we have a really bad case of slaying the messenger for the bad news that the pot-smoking, philandering, closet lesbian, control freak, quasi-communist, first couple of the libtards might just get to go away and shut their pie-holes; because the American People, in their heart of hearts, know that Hillary as president is a bad thing. We need a change, mostly because in my voting lifetime, the president's last name has been Bush or Clinton. Jesus! I just want someone I can vote for a candidate that has a different last name. I would put out a warning to you John, be careful. Don Clintonleone and the moonbat mob will be on you. Read Kathleen Willey's book, keep an eye on your family and remember that the Clintons never forget disloyalty, and those that are disloyal always pay for it.